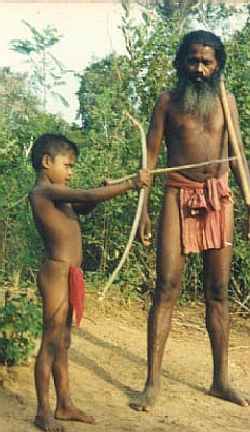 Below: Unapanawarige Bandiya teaches his son age-old survival arts. (from Kataragama group correspondent) Mr. Yasasiri Kasturiarachci, Basnayake Nilame of Ruhunu Maha Kataragama Devale announced on Sunday measures to ensure that the members of the Veddah community enjoy more facilities and are treated well when visiting Kataragama to perform their ritual duties. The announcement followed discussions with leaders of the Veddah community, including Veddah chief Uruwarige Wanniyala Aththo and Unapanawarige Bandiya. The Veddha delegation came to Kataragama after a three-day standoff triggered by the Veddah refusal to accept current conditions. "We are now satisfied with the steps taken by the Basnayake Nilame for the benefit of the members of our community who participate in the Kataragama Esala perahera," said Veddha chief Wanniyala Aththo following discussions with Maha Devale officials. 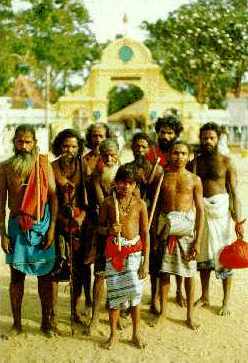 By age-old tradition, members of the Veddah community are entitled to stop the Kataragama Esala perahera in a ritual ambush using bow and arrow. Before the Kataragama God and His entourage proceed to visit the residence of His Veddah companion Valli Amma, Maha Devale officials must first pay tribute to the Veddah community. In olden days it is said that the tribute was paid in gold and silver. Lately, however, officials were giving only the smallest aluminium coins. Under the new understanding, the tribute will be raised to rupees 500 for each perahera. This tribute shall be in five rupee coins only. The Veddahs will also be provided with meals, coutesy of the Maha Devale, along with a small stipend to meet their casual needs. The traditional right of the Veddahs to remain under the tree in front of Valli Amma Devale was also reinforced. The Maha Devale will henceforth also provide a shelter for the exclusive use of the Veddahs.On completion of the annual Esala festival, the Maha Devale will also offer a gratuity of Rs. 5,000 to Unapanawarige Bandiya who performs the ritual ambush nightly on behalf of the Veddah community. The Basnayake Nilame pledged to grant greater recognition and support to the Veddahs. All parties expressed satisfaction with the terms of the understanding.